Decorating table is such a pleasure for me. I usually take a season's theme as in Japan. Origami decoration and Japanese and European antique tableware, centred with vintage Obi (for kimono) as table runner. "Jewel Sushi" - signature dish by a multi-talented Japanese artist and food designer Q Hisashi Shibata. 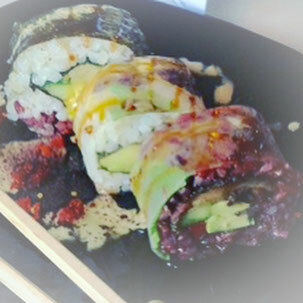 Organic, vegan sushi, topped with mango mayo and goji berries, as the title say, look like a jewel. Absolutely delicious! We were all mesmerised by the beauty of this foods. 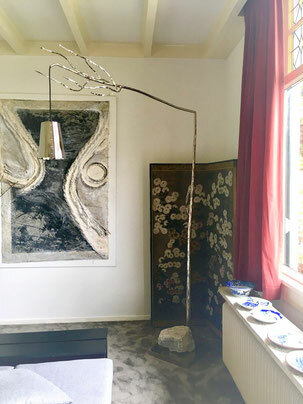 The highlight at my Salon was the interior installation of modern Dutch design lighting sculpture "Flintstones" by Brand van Egmond and a 300 years old Byobu, Japanese folding screen, Chrysanthemums. Both are connecting us with nature. "Flintstones" design reminds me of Japanese art form of Bonseki. 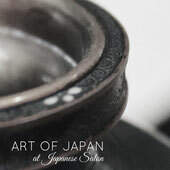 I will explore this subject a bit further in my monthly article of "Fragment of Japan" in July. Interested in having your private gathering here at Japanese SALON? 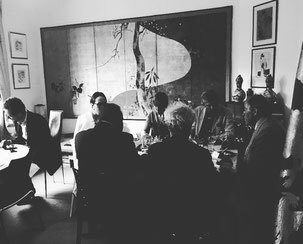 Elegant magical setting with top quality Japanese foods, surrounded by Japanese art & antiques in a Dutch villa built around 1900. Conveniently located in Bussum, with free parking in the garden, 5 min walk from Naarden-Bussum railway station. 6- 14 people for sit-down dinner. Please call at +31 (0) 6 50 69 38 87 or contact below for further details.